Jon-Adrian Velazquez, convicted of murdering a retired NYPD officer in 1997, is serving 25 years to life in Sing Sing Correctional Facility. A 10-year Dateline investigation revisits all the key players in the case and poses the question: Could Velazquez be innocent? Luke Russert reports 'Conviction' on Sunday, Feb. 12, at 7pm/6c. For 14 years, Jon-Adrian "JJ" Velazquez has lived behind bars, convicted and sentenced to 25 years to life for murder. As the years have passed, JJ has been a reluctant bystander to his own life, watching his world change from inside prison walls. In that time, his two sons have grown from children to teenagers. Jon-Adrian, Jr. was 5 when his dad was taken from him; his brother Jacob was just a month old. Their mother, JJ's girlfriend at the time, moved on with her life, and found a new relationship a few years after he went away. Yet through it all, one thing has remained constant: JJ has always insisted that he is innocent. 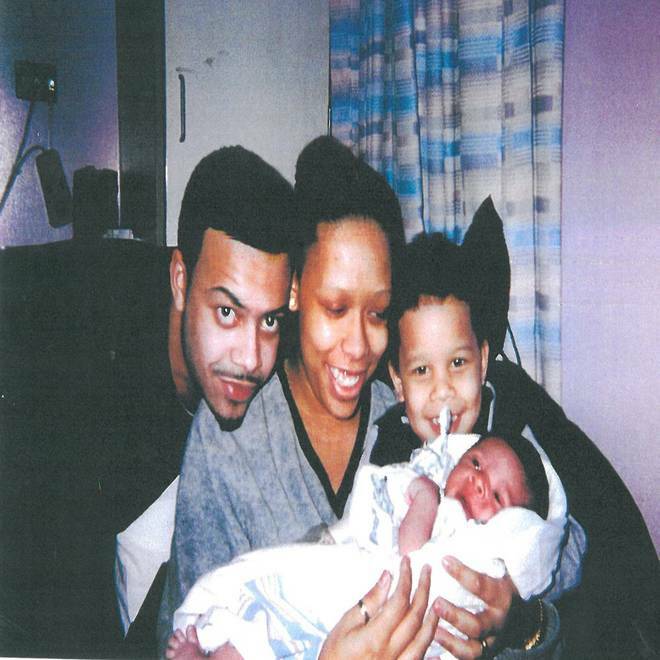 Jon-Adrian Velazquez with his girlfriend and two sons a month before he was arrested in 1998. I first heard about JJ in 2002, when I was working on a different "Dateline segment that detailed the plight of two men who were convicted of the 1990 murder at the Palladium nightclub in New York City. The men insisted they were innocent, and in an unusual twist, they had a veteran NYPD detective and a respected former federal prosecutor fighting for them. It would take five long years to finally see those men vindicated. We documented many disturbing revelations along the way, and it was all told in our 2007 broadcast, "In the Shadow of Justice." Inside the prison, JJ heard about our investigation of the Palladium case, and he began to write me letters. The first one arrived on Dec. 5, 2002. Having worked at "Dateline" for 16 years, I've received many similar pleas from inmates who declare they are innocent. Most are either lying or don't have the proof to back up their claims. But there was something about JJ's letters that stirred something in me. So I decided to visit him, and to be open to the possibility that maybe he was telling the truth. As we sat down in the visiting room at the maximum security Greenhaven Correctional facility, I was surprised to find that he was not withdrawn or despondent or even resigned to his fate. To the contrary, he was vibrant, articulate and adamant not just of his innocence but of his eventual vindication. At that meeting, I remember JJ challenging me to try and find him guilty. He wanted me to turn over every stone. He insisted that he was an innocent man. I promised him I would take him up on his challenge, but if he lied to me about anything -- even one time -- I wouldn't be coming back. He didn't appear concerned. NBC's Dateline Correspondent Luke Russert discusses Dateline's upcoming documentary that follows the conviction of Jon-Adrian Velazquez, who's been in jail for 15 years for a crime he says he didn't commit. Jon-Adrian's mother, Maria, also joins Rev. Al Sharpton and says her son is innocent. The more I learned, the more I was drawn to the story. If the Palladium case represented a bureaucracy gone terribly wrong, JJ's story was something entirely different. It was the story of a 22 year old man convicted on painfully thin evidence and then forgotten, no longer represented by attorneys and without legal recourse. He filed his own final appeal to the courts, and was denied. He couldn't afford his own investigation, and with nowhere else to turn for help, he wrote to me and asked for it. It's taken 10 years, but on Sunday, you will hear JJ's story. You will hear from the witnesses who convicted him. You will meet one of the jurors who said, "Guilty." You will meet the lawyers who now say a grave injustice was done, and learn of the evidence that they say should set him free. Despite his guilt or innocence, what's most interesting to me about JJ's story is how difficult it is to get a case reconsidered once a jury has rendered a verdict. The experts will tell you that any inmate who has been convicted by a jury faces an uphill battle – and with good reason. The hard truth is once convicted and considered by an appellate court, the cell door locks and it won't reopen without evidence short of a confession from the real killer or DNA -- something that seems about as likely as lightning striking that lock. And sometimes even that isn't enough. For good or bad, that's the system. But one thing is for sure: to stand up to it, and to withstand it, you'll need a healthy dose of conviction. Dan Slepian is a producer at "Dateline NBC." Click here to send him an email.